The jaw is connected to the temporal bone on the side of the skull, and can be moved out of position -- known as a dislocation -- or broken on the lower portion -- known as a fracture. A fracture typically causes two points of breakage: a direct breakage where an injury occurred, and an indirect breakage where the jaw fractures again farther away from the point of impact. Either occurrence can cause extreme pain and lead to improper healing if not corrected. Various symptoms can indicate that your jaw is fractured or dislocated. Consider if you have recently experienced an injury or trauma to the face. Facial trauma is the most common cause of a broken jaw, according to the University of Wisconsin Hospital. If you have taken a punch, experienced an automobile accident, fallen or were injured on the playing field, these are all common causes of a broken jaw. Attempt to move your jaw slightly by opening and closing it. Your jaw may be broken if your bite feels off when you close it or you cannot open the jaw widely. 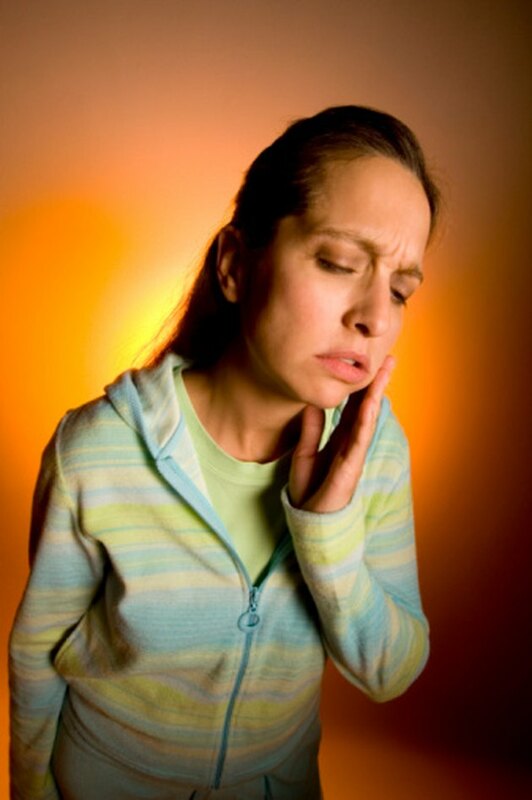 Lost teeth also are complicating factors that increase the likelihood of a broken jaw. Examine your face for any visible signs of swelling or bruising. Look for any protrusions on the sides of your jaw, such as lumps or bumps. Swelling or bruising above the jawbone may also indicate a broken jaw. Evaluate your pain level. If your pain gets worse when you attempt to bite or chew, you may have a broken jaw. Another indicator is if your face feels numb, especially on the lower lip. If you suspect your jaw is broken, limit movement as much as possible until you can seek medical treatment. Wrapping a bandage around your head can help to limit movement. Seek medical evaluation immediately if you think your jaw may be broken. Failure to treat a broken jaw can result in an infection in the jaw area and cause you to breathe food or blood into the lungs, which can be dangerous and increase your risk for future jaw breakage. If you suspect your jaw is broken, do not try to re-set the jaw into position. Doing so could result in further damage.